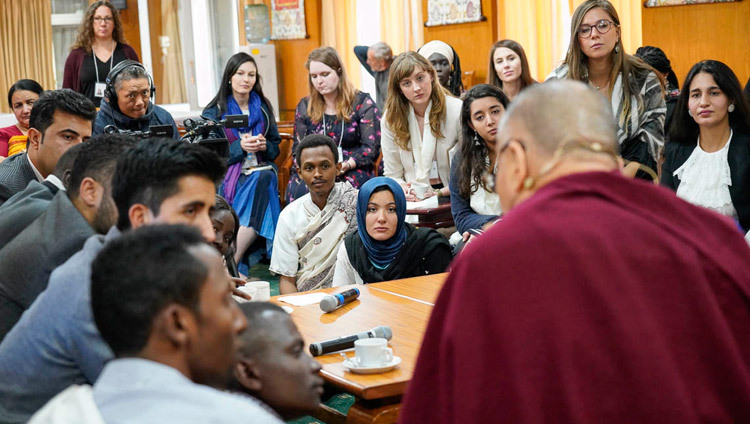 (TibetanReview.net, Oct25, 2018) – The Dalai Lama has on Oct 24 met with 28 youth peace builders from 14 countries that are deeply hit by conflict at his residence in Dharamshala, India. This was the third of an annual dialogue series he has been carrying on with a group called the United States Institute of Peace. The aim of the dialogue is to strengthen the abilities of young leaders working to build peace in the world’s most conflicted regions. The youth peace-builders are drawn from countries across Africa, the Middle East and Asia. This year’s participants came from 14 countries that included Syria, Afghanistan, the Central African Republic, Iraq, Somalia, Colombia, and Nigeria. The Dalai Lama called the youth and education the key to changing people’s way of thinking for transforming the world towards peace. He has said humans share an innate nature of being compassionate and activists should use the more and more suffering they witness as an opportunity to strengthen their determination and willpower.